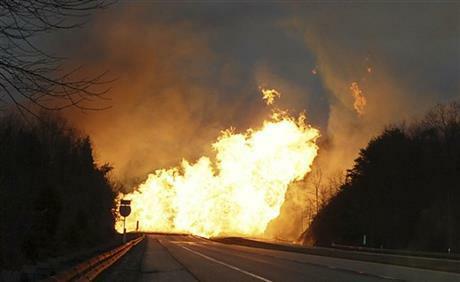 A natural gas pipeline explosion occurred in Sissonville, W.Va. on December 11, 2012. The explosion caused damage to multiple homes and charred 800 feet of roadway along Interstate 77. No injuries were reported in the incident. “West Virginia’s booming natural gas industry relies heavily on pipelines, which means they must be safe, reliable and durable. As Commerce Committee Chairman, I’ve worked hard to make sure there is oversight of our pipeline operations to prevent accidents that could harm both our communities and our economy,” said Rockefeller. “In West Virginia, investing in natural gas is important for job creation and economic growth, but the bottom line is that we need to make sure drilling is done safely,” Manchin said. “It would be pennywise but pound foolish not to invest in pipeline safety,” said Rahall, top Democrat on the House Transportation and Infrastructure Committee with jurisdiction over PHMSA. $496,943 – West Virginia Public Service Commission – The Commission received this funding through PHMSA’s fiscal year 2013 Pipeline Safety Base Grant program as a reimbursement to help alleviate the cost of the State’s pipeline safety programs. $200,717 – West Virginia Emergency Response Commission – The Commission received this funding through PHMSA’s Hazardous Materials Emergency Preparedness (HMEP) Grant Program, which gives States assistance in performing hazardous materials response duties. As Chairman of the Senate Commerce, Science, and Transportation Committee, Senator Rockefeller is in charge of Congressional oversight of pipeline safety. Rockefeller authored legislation that was signed into law in 2011 to strengthen pipeline safety. He also held a field hearing on pipeline safety in Charleston earlier this year in response to the pipeline explosion in Sissonville, West Virginia on December 11, 2012. The Commerce Committee has held four hearings on pipeline safety in the past three years.